This article is about the newspaper in Bergen County, New Jersey. For other uses, see The Record (disambiguation). The Record (colloquially called The Bergen Record or The Record of Hackensack) is a newspaper in North Jersey, United States. It primarily serves Bergen County, though it also covers Hudson, Essex and Passaic counties as well. It has the second largest circulation of New Jersey's daily newspapers, behind The Star-Ledger. Its editor is Richard A. Green. The Record was under the ownership of the Borg family from 1930 on and the family went on to form North Jersey Media Group, which eventually bought its competitor, the Herald News. Both papers are now owned by Gannett Company, which purchased the Borgs' media assets in July 2016. For years, The Record had its primary offices in Hackensack with a bureau in Wayne. Following the purchase of the competing Herald News of Passaic, both papers began centralizing operations in what is now Woodland Park, where The Record is currently located. In 1930 John Borg, a Wall Street financier, bought The Record. In 1974, writers in the area voted The Record first in the categories of writing, editing and local coverage. It provided different local news coverage for various areas in its distribution range. In 1983, the paper had a daily circulation of just over 149,000 with its readership described as "upscale". On September 12, 1988, its afternoon publication and delivery changed to early morning. When combined with more centralized distribution requiring carriers to have automobiles, many "youth carriers" (paperboys) were put out of work. The paper's approach to coverage made it "read like a magazine". Rather than a focus on breaking news on its front page, it featured "The Patch", a thematic topic or investigative report. In the aftermath of the September 11, 2001 terrorist attacks on the World Trade Center in New York City, a photographer for The Record, Thomas E. Franklin, took a photograph of three firefighters raising an American flag over the rubble of what had been the World Trade Center. This became an iconic photo known as Raising the Flag at Ground Zero. A follow-up story by Jeannine Clegg, a reporter for The Record, about the flag raising efforts by the firemen that led to the photo appeared in the newspaper on September 14, 2011. The Record owns the rights to the photograph, but has licensed it in exchange for donations to September 11 causes, as long as the photo is used in a "dignified and proper manner" for non-commercial purposes. Robert Leckie (1920-2001), rejoined The Record after returning from World War II. 1 2 "2013 Top 100 Daily Newspapers in the U.S. by Circulation" (PDF). BurrellesLuce. January 31, 2013. Retrieved July 17, 2013. ↑ Pompeo, Joe (July 6, 2016). 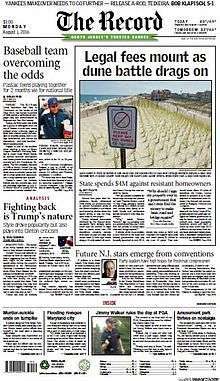 "Gannett buys North Jersey Media Group papers". Politico. Retrieved July 9, 2016. 1 2 Aron, Joan B. (1969). The Quest for Regional Cooperation: A Study of the New York Metropolitan Regional Council. University of California Press. pp. 67–. Retrieved January 16, 2014. ↑ Weber-Leaf, Pamela. "Carrying history: Paperboys (and girls) of The Record". (201) Magazine. BergenCounty.com. Retrieved April 16, 2015. ↑ "'Raising the Flag at Ground Zero:' Photographer's Account". Pioneer Times. September 15, 2011. Retrieved July 17, 2013. ↑ "Raising the Flag at Ground Zero". Alfred NY Biz. Retrieved July 17, 2013. ↑ "About the Photo". Ground Zero Spirit. North Jersey Media Group. 2011. Retrieved July 17, 2013. ↑ Rohan, Virginia. "Robert Leckie's postwar experiences", The Record (Bergen County), May 17, 2010. Accessed August 19, 2013. "Robert Leckie (James Badge Dale) is seen returning to Rutherford, where he courts his pretty neighbor, Vera Keller. He also reapplies for his job as |a local sportswriter at The Bergen Evening Record.... As it turns out, he did return to The Bergen Evening Record, not as a sportswriter, but as a feature writer, reports his daughter, Joan Leckie Salvas."